Diners love new takes on familiar dishes, and this recipe is a spin on a popular classic that’s sure to delight crowds. Just follow this quick and easy-to-make recipe featuring the golden touch of Knorr Salted Egg Powder, and turn ordinary fried rice into an extraordinary classic. Mix well Knorr Mashed Potato with water. Mix wheat flour with hot water evenly. In a mixing bowl, add mashed potato, wheat flour mixture and seasonings A and mix thoroughly. Set aside. Mix the seasonings well, set aside. Mould mashed potato into a ring. Heat a pan of oil to 150°C, deep fry potato ring and ensure the centre is hollow, set aside on a plate. Blanch prawns, scallops, corn kernels and green peas. Drain off excess water. Melt butter in a pan, shallow fry salted egg powder till fragrant, stir in rice and add prawns, scallops, corn kernels, green peas, carrots and seasonings B. Stir fry till evenly mixed. 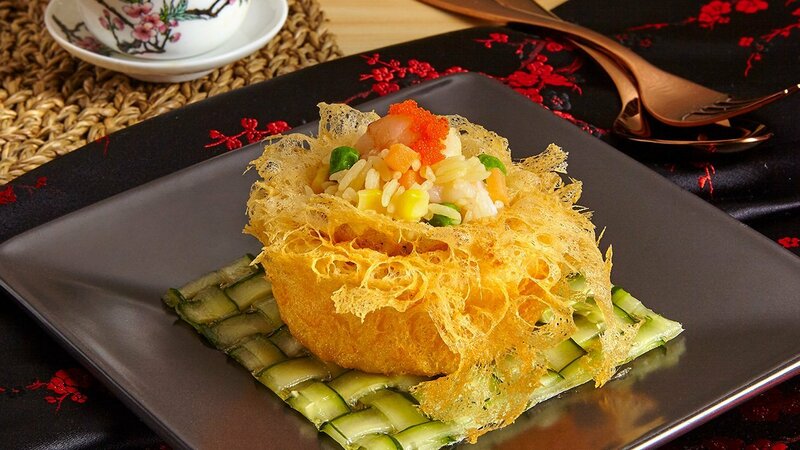 Transfer fried rice to the centre of the potato ring. Garnish with fish roe. Ready to serve.